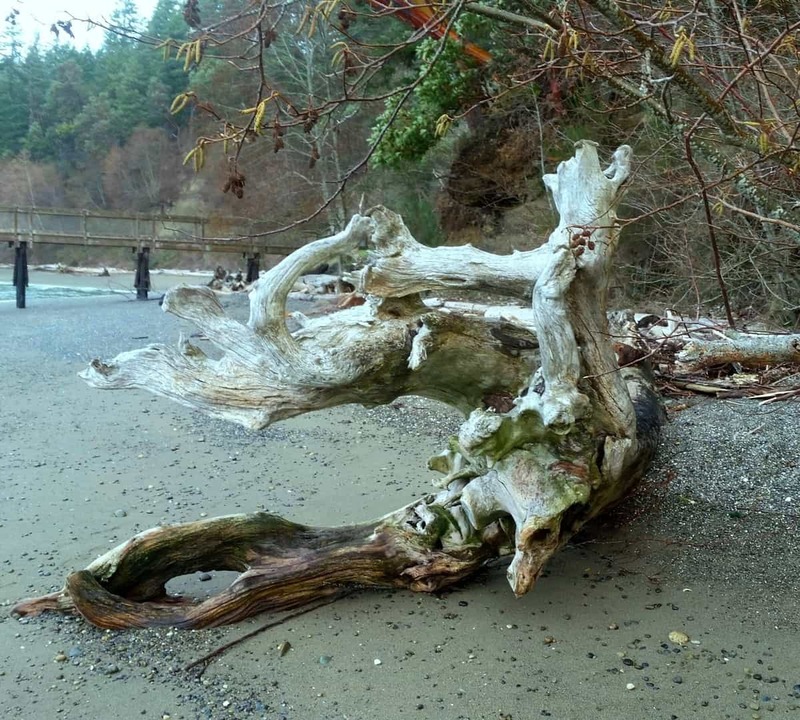 When I moved to Washington State, I couldn’t help but notice that on every beach there were these amazing natural pieces of art in the form of driftwood. They’d been beaten and battered by the crashing waves and tossed about to the point of ruin, but I was mesmerized by their calming forms. When I thought about pouring on driftwood, I wondered if I could create even more movement for something that’s already so fluid. And I was attracted by the challenge of trying something new. I’d never attempted this before, so I decided to document the process and share with others. I remember researching beforehand the first time I brought home driftwood from the beach. It was so frustrating. I wanted to salvage this beautiful wood, give it a great cleaning, and be able to use it within a day or two. The internet soon squelched that! 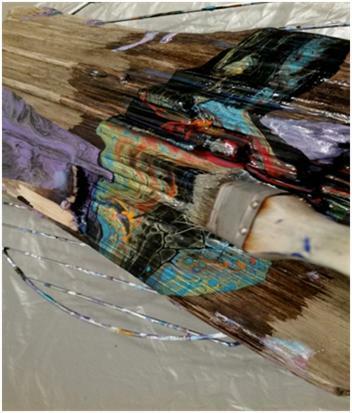 The process of prepping your driftwood for any type of painting can seem daunting, but it’s actually quite easy. It’s the wait times that can drive you crazy! Don’t worry–I’ll walk you through the process of reclaiming driftwood from start to finish, so you can start using this wonderful natural material for your projects. First, be sure to stay clear of anything affected by black mold. If the wood has black areas that don’t wash off easily, leave it at the beach. Do not bring your new find into your home or studio until you go through the cleaning process. There are likely to be critters living in the wood, and most you won’t be able to see. You’ll need to do your first cleaning outside. Don’t cut or sand the wood at this time; it may simply spread unwanted, unseen critters! Wearing a good pair of rubber gloves, preferably elbow-length, spray the piece of wood with a hose/sprayer. Clean off any and all debris possible. If you have a scrubber brush for outdoor projects, use it! You’ll get a lot off that way. Softer brushes are better if you don’t want to leave any marks, but stiffer brushes work better for getting at dirt pockets and removing bark. Pat the cleaned driftwood dry with an old rag, and place it somewhere to dry outside. This is a super important step. Many little critters (usually insects) live inside driftwood, and you don’t want them in your home. They’ll gnaw away at your workspace, and then start on the rest of your furnishings. Ugh! Deal with them right away to prevent problems. First, put on your gloves again. Next, apply a non-toxic, biodegradable insecticide. You’ll need this to kill insects on the surface and in the nooks and crannies of the wood. Be thorough! I use Orange Guard, which can be found at Amazon. This product is organic, non-toxic, and much safer to use than many others. Another huge plus: It’s water based, so it won’t stain or leave oily residues that can really mess up your pours. Leave the wood outside with the insecticide for at least 24 hours, to give it time to work. If you’re using a different product, just follow the instructions on the bottle. Being sure to wear your gloves, and get set up with a bucket of hot, soapy water. Wash the wood thoroughly and then rinse it well. You want to clean off the insecticide, as well as any residual debris you missed earlier. Don’t rush the rinsing step, since you don’t want any soap or insecticide solution to mess with your art! This is the last step you’ll need gloves for. Pull them on one more time, then decide where you want to do your soaking. Depending on the size of the driftwood, this next step can be done inside or out. You’ve already dealt with the insect concerns, and the wood should be relatively clean by now. 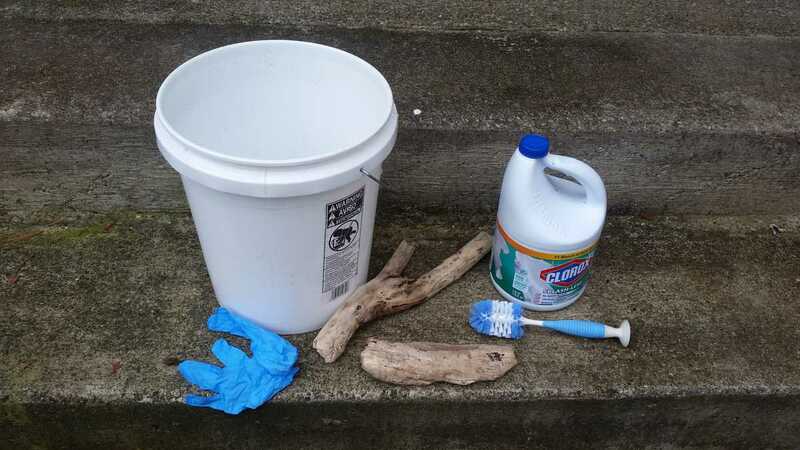 You’re going to need to find a tub, basin, or other container in which to soak your driftwood. If you’re doing a big piece, the bathtub can work well. Soak the wood in a 1:5 bleach/water solution for at least one hour. After an hour, I use a baby bottle brush to clean off anything still stuck on the wood. Don’t use a wire brush, scraper, or scrub sponge as this will damage the wood. This concentration of bleach to water does not typically lighten the driftwood. If you want a more bone-like color, use a stronger solution of bleach to water. My approach is to thoroughly clean the wood only. Rinse the wood thoroughly and pat it dry with a clean, soft cloth. This was my hardest step to master! It can take a lot longer than you expect, so have patience. Always dry driftwood indoors. Set it aside in a closet or spare room, not in the garage. Placing the clean wood outside is just an invitation for critters to move back in. Place your driftwood on a drying rack, or anything that will allow air to flow all the way around the wood. Now, walk away and forget about it. Keep it in a warm dry place for at least a week. This is a conservative estimate on how long it will take to dry, so don’t try to get away with just a few days! The thicker the piece, the longer it will take. Drying time can also vary depending on where you live. In an arid location, it may dry much faster, whereas in a super humid location, you may need to give it more time. Don’t paint on the wood until it’s completely dry! You don’t want to waste all the time and effort you already invested. 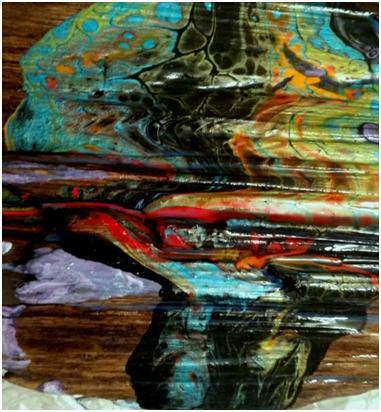 Painting on wet wood can cause your paint to loosen or change color once it dries. It can also allow paint to sink into areas where you may not want color, and cause additional cracks once completely dried. Once you’ve cleaned, sanitized, and dried your wood, now is the time to sand off any spikes, splinters, or other rough spots you want to remove. This may or may not be necessary, depending on the piece you’ve scavenged. Use the finest grit sandpaper you can find. I use a blowdryer to take off dust particles after sanding, then wipe with a clean, damp cloth to remove remaining dust. Preparing the wood for paint can vary depending on the type of paint and process you want to create. Good news, pouring artists: You don’t need to do anything further. Once your driftwood is completely dry and smoothed to your liking, get your pour on! I took one large piece of driftwood that I rescued from the beautiful Puget Sound to use for the greater good. It gave its life for about 13 separate experiments. It’s given me quite a lot of experience, so I can offer you a few further tips on how to do successful acrylic pours on driftwood! If you have chosen to do a free handed, dirty pour, or even flip and drag, it doesn’t matter how uneven and curvy the wood may be. Simply use your imagination. 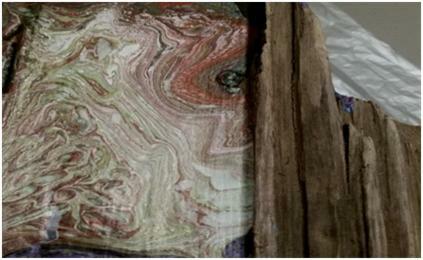 Remember, the flow will go wherever it wants, so a slow pour such as the tree ring does not behave like normal. Be open to letting the wood show you what to do! Below, in purples, is the first pour I tried. It was a dirty cup flip, with very little manipulation. As you can see, it ran all over and completely pulled out any cells it started to create. You can’t really tell in the picture, but the wood is very wavy. This next picture was a tree ring section of the driftwood, and even though it was a fairly flat area, it also just ran—without any manipulation. And it broke apart, showing the white base paint; you can hardly see the metallic greens or vibrant red. In fact, the tree ring picture actually looks better in the photo than in real life! Both were “Christmas candy throw up,” as I like to say, but they will be great for a campfire this summer! 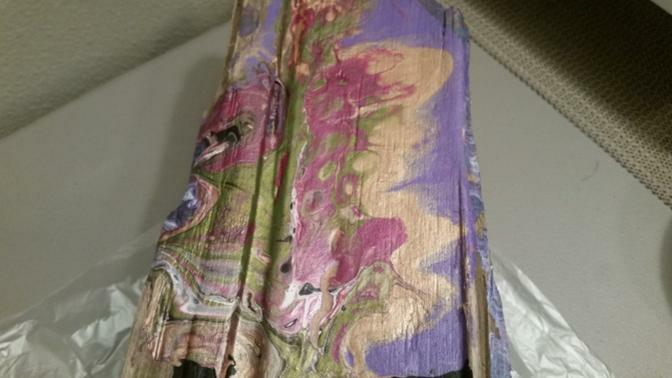 On the purple try above, the pour ran everywhere—including all the way underneath the piece. My suggestion is to tape off around area(s) you want to pour on, remembering to also tape off the bottom unless you want the paint to wrap around underneath. This seems to be a nice ratio of wood grain to contrasting paint, at least for my taste! In the purple experiment, the pour went everywhere. There’s not so much contrast of wood and paint. The tree ring experiment was closer to 50 percent and would have been perfect if the paint hadn’t run and separated. Below I used a 1:1 paint to Floetrol ratio, with water to thin as needed. I left the paint just a little thicker than normal so it wouldn’t run into areas I didn’t want painted. I used a black base and vibrant colors for this final experiment, four drops of silicone in all colors except black, and no white. I did a simple flip and drag, although because it wasn’t level, I had to drag immediately. There was ZERO manipulation. And as you can see, it still did its own thing, but we have cells. It did run into another purple experiment, but it was all a learning lesson! Since I was experimenting only, I used inexpensive paints. Colors would be brighter with better quality paints. All positive! This ratio should work well for you. If you want the pour to cover the driftwood with a thick/smooth surface (not necessarily level, but smooth), you will need to make sure that area is sanded smooth and varnished before you pour. That way, the paint will dry more like the picture above. If you want the contours of the wood to show, leave the wood as natural as possible and only varnish after your pour has dried. I love the contours, so you’ll see in the examples that I left them natural. I varnished with Liquitex using a brush to reach all the textures and levels on the finished piece. Now that I’ve done lots of experimenting, I think it’s time to really start to play with driftwood. I do think I’ll wait until the current snow melts here, though, since I can’t even see the driftwood on the ground right now. Happy pouring! The email you sent me with the link does not work. It comes back as page not found. I had to type in the “How to Create Stunning Pours on Driftwood” into your search to find it. Just thought you’d want to know. Love your art! Hi Vickie, thank you for letting me know. I don’t have access to the links, but have let the folks on the Web team know. I appreciate the heads up, and so sorry for the inconvenience! Glad you liked it. Should I use the same cleaning process on a regular piece of cedar wood cutted from my backyard? I use the same process for all raw wood. Also, if the cedar is fresh cut, after cleaning it, you’ll need to set it somewhere dry and warm for a couple months. Any fresh cut wood will continue to release moisture for at least a few months. 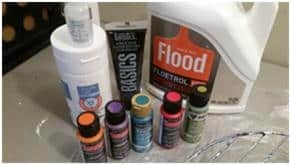 You want this process to stop prior to painting. 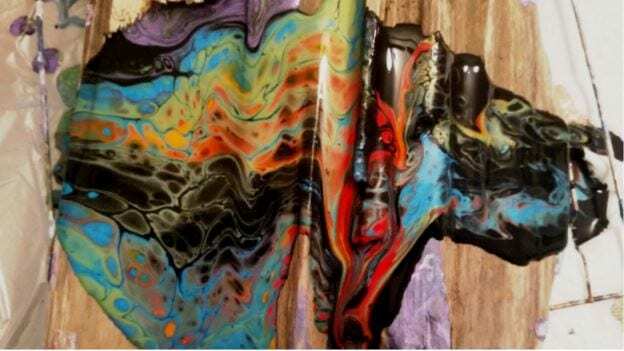 Sap oozing from under a finished pour is not pretty, plus is can damage the painting from on top of, as well as below the paint. Think of glue spilling on a finished painting – not a happy thought. I’d give it at least two months dry time, more if you see a lot of sap.